Worldwide economy is at the threshold to the fourth industrial revolution. Driven by the Internet, real and virtual world are merging to create the Internet of Things (IoT). Topics like Industry 4.0 are omnipresent when you talk to experts in that area. Focus of attention then are networking opportunities of sensors and actuators by means of field bus systems or the networking of machines via standard protocols. Cloud services almost appear to be taken for granted in this context for data exchange or storage. But is this the only way how information can be communicated between the devices? This is the question we want to answer here in this article. 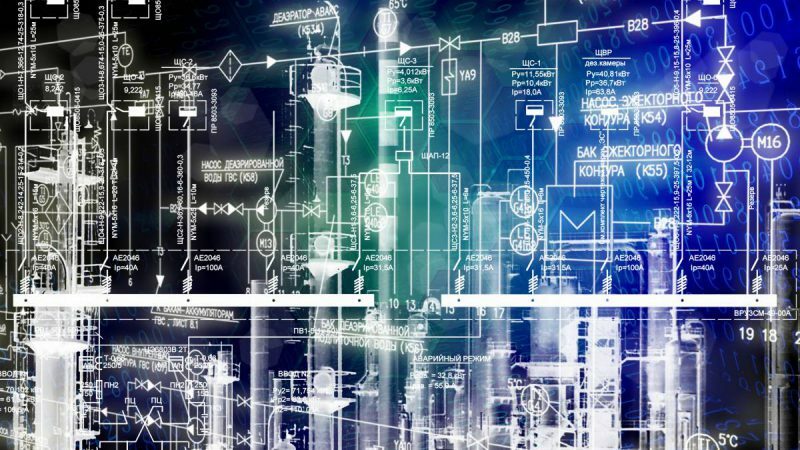 At this point, let’s clarify again what the future program Industry 4.0 is about and what it means with regard to challenges and opportunities. 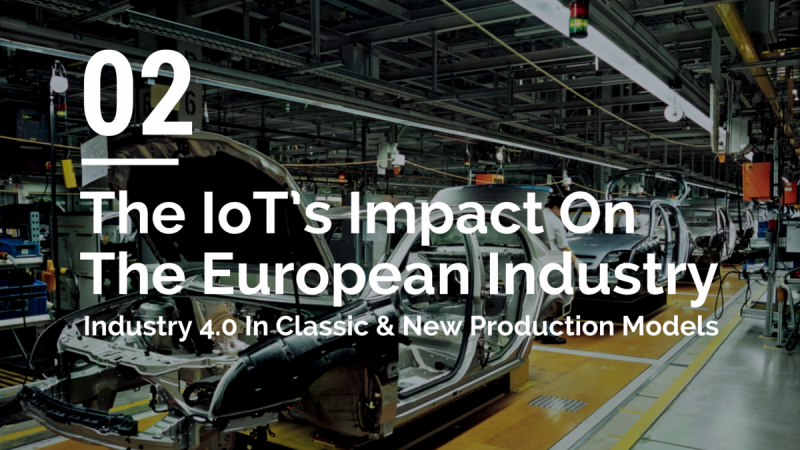 If we talk about Industry 4.0, the optimisation of production and distribution processes with respect to more flexibility and efficiency is meant. That does not sound new, but digitisation now plays the essential role for the fourth industrial revolution. A variety of technologies are used, from semiconductor products like sensors and microcontrollers, to things like autonomous robots and simulators, big data and analytics, and, of course, cloud computing. Design documentation, engineering drawings and descriptions for production processes need to be available during every step of the production. Manufacturing processes will be documented at every stage. Consequently it is necessary that data will be stored. Here cloud computing often comes into play. There are certainly many advantages that speak for could computing but also certain well-known reservations, such as data protection. For quite some other reasons other technologies could also be an alternative, such as near field communication (NFC). This wireless proximity technology is used already in many areas. Many of us have most likely been confronted already with mobile payment, next-generation ticketing schemes or car sharing services that use NFC. But also in industrial settings it can be used to store and process data and information about manufacturing processes. In the following, we will explain how that works. At the beginning of the production a programmed NFC chip will be placed onto the workpiece. Respective NFC readers are mounted on the machines and plants, which are able to read information and process the workpiece respectively. When finished work, processing steps can be documented again on the NFC chip. With the help of dedicated tablets, NFC tags can be read and adapted locally if necessary. Additional production processes and flows of goods can be added or modified. Even if NFC chips don’t require an external power supply, they cannot be mounted on every workpiece in some circumstances. But they can certainly be attached to transportation boxes. One of the most essential advantages is the immediate access of the data. Independent from a communication network, information are available only seconds after the workpiece arrived at the workplace. This also and in particular applies for harsh conditions or far away manufacturing sites. 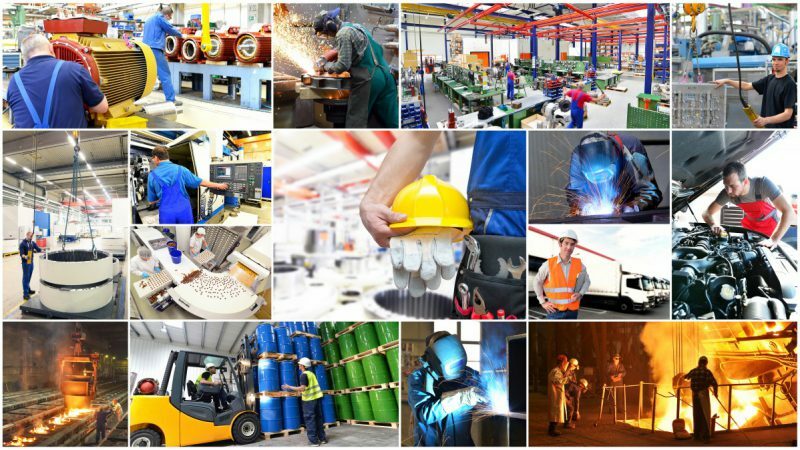 Further benefits of NFC technology in industrial settings are facilitated maintenance in the occasion of a service case, because the need for direct access to an IT infrastructure can be slipped. Information can be read and configured on the spot. 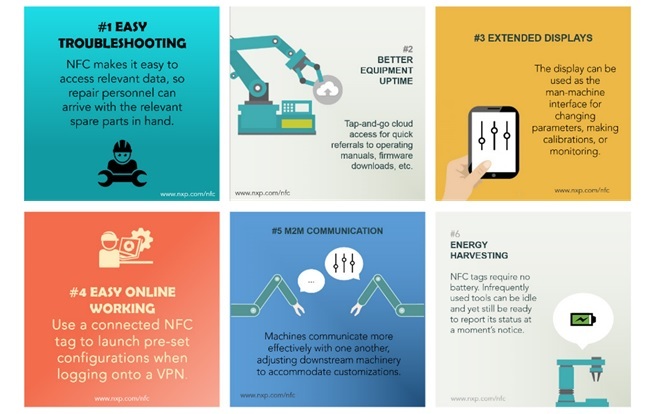 In a blog article, Laurent Dardé Marketing Director for Security and Connectivity at NXP Semiconductors, names even more advantages how NFC enhances manufacturing and Industry 4.0. NXP Semiconductors, manufacturing partner of EBV Elektronik, offers a wide range of near field communication solutions. There are several options available when adding NFC technology to a system: NFC frontends, controllers and connected tag ICs. The frontends are needed to provide an NFC function. The controller is responsible to connect the frontend with a microcontroller while NFC connected tags are just passive microchips used in smart NFC tags. The PN5180 high-performance multi-protocol full NFC Forum-compliant frontend offers high output power, Dynamic Power Control and multiple power-saving features. This advanced, multi-protocol NFC frontend delivers efficient, robust, and reliable operation, even in harsh conditions. The NFC Forum-compliant controller PN7150B0HN is optimized for fast design-in and ideal for home-automation applications such as gateways and work seamlessly with NFC connected tags like the NTAG I2C plus. 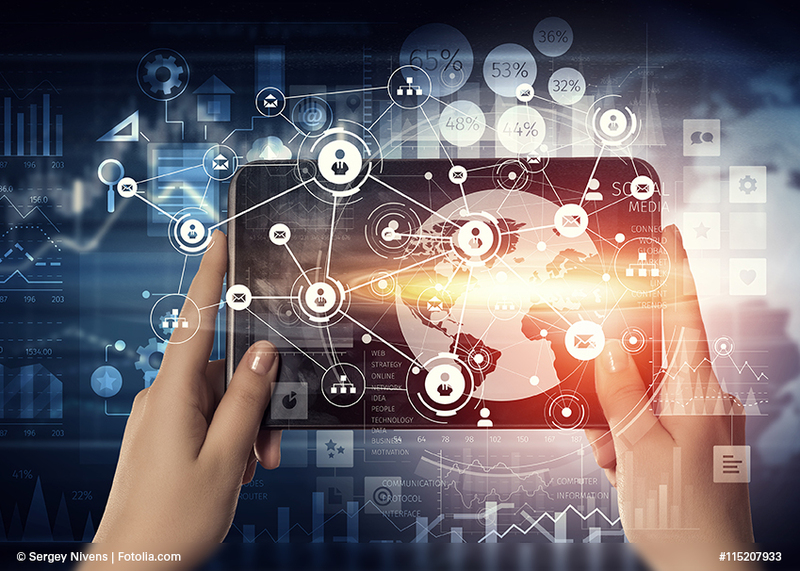 To put it in a nutshell, NFC technology used in industrial setting offers an opportunity to store manufacturing data locally at the workpiece and is attractive due to a high availability of the information. Furthermore, this technology is already very common. Many smartphones, tablets and handhelds are already equipped with NFC, which could result in a cost-effective implementation. Semiconductor companies like NXP, moreover, have collected a lot of experience already with application areas like contactless payment, access control or ticketing. Nevertheless, cloud computing will still remain relevant for the Industry 4.0 system. If it comes to hybrid solutions for data exchange, NFC is certainly a complement that is definitely worth having a look at. If you are keen to learn more about how EBV Elektronik is able to support with regard to the Industry 4.0, just visit our website. Reach out to us with your questions by contacting us here. Regional Application Manager. Driven by the unlimited goals we can achieve with modern technology and great engineering. My updates are inspired by trends, challenges and applications I identify in the semiconductor market together with our customers and suppliers.